March 28, 2018 - "Press Releases"
Occasionally, an existing customer has the opportunity to grow through a new project. The customer needed help with specialized knowledge of filament technology for the specifications to meet their expectations. Company Background: The customer manufactures cutting tools. Challenge: The customer needed assistance with knowledge of specialty filaments and grains for a new project. Assessment: To engineer a custom solution, comprehensive knowledge of the application and current technology in the brush world would be required. Using the basic information provided by the customer, the Tanis application team was able to narrow down the options to offer test tools for the customer to sample. The feedback from the customer pinpointed the exact filament technology and brush construction required to provide an end solution that would improve the quality of the product sold by the customer. 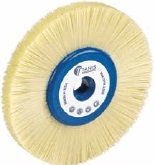 Brush Type: Diamond Wheel Brush. This type of brush is most effective on super hard materials such as tungsten carbide, ceramics, diamond and glass. Diamond wheel brush tools are also effective on drill honing, polishing and honing indexable cutting tool inserts. In the end, the customer was happy with the technical support and quick response time from the Tanis team. Tanis helped provide a solution to the customer with minimal interference to their daily operations. Productivity, quality, throughput, uptime – we develop brush products to help you meet your goals. Let us find a brush to fit your requirements or design one just the way you need it.